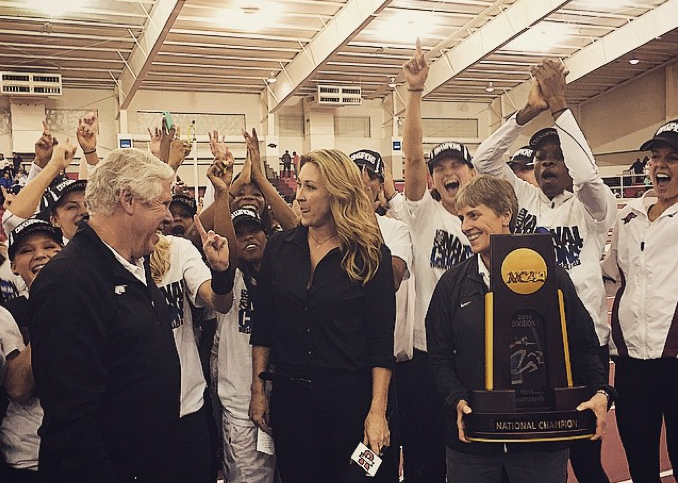 The women's track and field team calls the Hogs after winning the 2015 Indoor Championships. Athletic Director Jeff Long joins the women's track and field competitors for a team picture. Sparkle McKnight holds the women's trophy aloft at Randal Tyson Track Center..
Coach Lance Harter tries to duck away from a victory dousing, to no avail. Sandi Morris wins the pole vault, tying her collegiate record. The national champion distance-medley relay team, from left, Dominique Scott, Therese Haiss, Jessica Kamilos and Sparkle McKnight. Dominique Scott celebrates after winning the 3000-meter run. Coach Chris Bucknam and the men's track and field team celebrate their No. 3 finish in the NCAA national championships. Omar McLeod celebrates after setting a new collegiate record in the 60-meter dash and winning the event. Kemoy Campbell finished second in the 5000-meter run and fourth in the 3000. Coach Lance Harter and the women's track and field team receive the National Champions trophy Saturday. FAYETTEVILLE, Ark. – The top-ranked University of Arkansas women’s track and field team made history Saturday night at the Randal Tyson Track Center with the program’s first-ever national championship. The victory is also the first at the Division I level for head coach Lance Harter and the first for any women’s program at Arkansas. The Razorbacks won three national event titles during the weekend to score a program-best 63 points atop the team standings. The University of Arkansas men's track and field team finished third in the weekend competition, behind Oregon and Florida. Prior to Saturday’s result, the women's program had a previous high finish of third place at the 2000 national meet in Fayetteville. The Razorbacks entered the 2015 meet with a top-five finish in three of the previous four years before ascending to the top of the team podium Saturday. 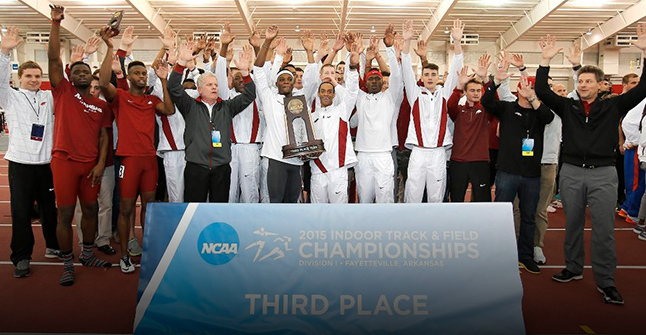 With 63 points, the Razorbacks posted the third-highest team total in meet history. Arkansas scored 50 of its points Saturday. Sandy Morris ties her previous collegiate record in the pole vault. Dominique Scott celebrates her victory in the 3,000-meter run. Doubling back from Friday’s anchor of the victorious distance-medley relay, Scott claimed her first NCAA individual title with a first-place run at 3,000 meters. The Razorback senior crossed the finish line to a standing ovation from the home crowd in a time of 8:55.19, more than three seconds ahead of the runner-up. Scott is the second runner in program history to win an indoor title at 3,000 meters, joining Sarah Schwald who won in 1995. Morris tied the NCAA indoor meet record in her victory in the pole vault, posting a final clearance of 4.60m/15-1. She was five-for-five to open the competition before her first miss at 15-1. She went on to clear the bar on the second attempt and win her first national title. With her result Saturday, Morris now has five winning clearance of 15 feet or higher this season. 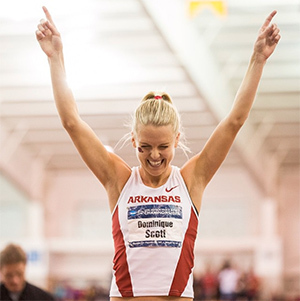 She joins Tina Sutej (2011, 2012) as a Razorback national champion in the pole vault. In her NCAA debut with the Razorbacks, Ellis-Watson clocked in with a personal-best time of 51.52 in a runner-up finish at 400 meters. She was back on the track in the final event of the weekend with Williams, Daina Harper and Sparkle McKnight to finish second in the 4x400-meter relay. The quartet combined for a school-record time of 3:28.70, knocking nearly one second off the previous record. That time also represents the seventh-fastest time in NCAA history. Alex Gochenour and Taliyah Brooks combined for seven points in the pentathlon with their respective fourth- and seventh-place finishes. Gochenour established personal bests in four of five events to finish with a personal-best score of 4,430 points which makes her the No. 9 all-time performer in NCAA history. In her meet debut, Brooks set two personal bests to score 4,230 points, also a lifetime best. Williams’ first appearance on the track resulted in a fourth-place finish at 800 meters, crossing the finish line in 2:04.33 in her NCAA finals debut in the event. The Razorbacks’ remaining two points on the scoreboard came from Myers who was seventh in the triple jump. As the team’s lone double qualifier in two individual events, she picked up three points during the weekend couple with her showing in Friday’s long jump. A tape-delay broadcast of the championship will air Monday, March 23, starting at 6 p.m. on ESPNU. Dwight Stones and Larry Rawson will handle the play-by-play and color commentary duties, respectively, with Jill Montgomery reporting from track side. Replays of #NCAATF day one and two are available on ESPN3 and through the WatchESPN app. 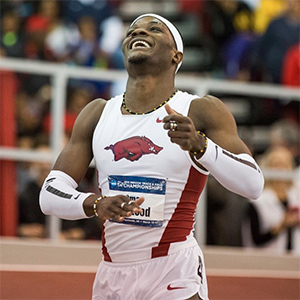 Razorback Omar McCleod won the 60-meter hurdles, setting a new collegiate record, at the 2015 NCAA Indoor Championships at the Randal Tyson Track Center. The University of Arkansas men’s track and field team registered a third-place finish Saturday. 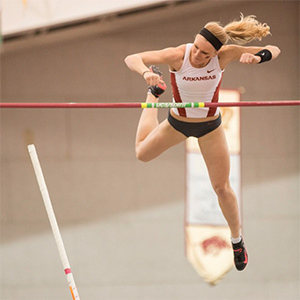 With their weekend showing, the Razorbacks have tallied a top-three NCAA indoor finish in four-consecutive years, including a team title in 2013. The Razorbacks finished the two-day competition with 39 points, scoring in seven of the nine events in which they had national entries. In addition to McLeod’s win in the hurdles, Arkansas scored with Kemoy Campbell at 3,000 and 5,000 meters, Jarrion Lawson in the long jump, Andrew Irwin in the pole vault and its 4x400-meter and distance-medley relays. Omar McCleod celebrates his collegiate record in the 60-meter hurdles. McLeod successfully defended his NCAA title in the 60-meter hurdles in a collegiate-record time of 7.45, breaking the 18-year-old record of 7.47 set by Reggie Torian of Wisconsin in 1997. With his performance, McLeod also established a new meet and school record and had the largest margin of victory in the event in NCAA Championships history. He finished 0.24 ahead of the second-place runner while places second through eighth were separated by just 0.12. In his second race of the weekend, Campbell turned in a fourth-place finish at 3,000 meters in 8:00.57 to add five points to the Razorbacks’ team total. He was back on the track after Friday’s national runner-up effort at 5,000 meters. He was the team’s top scorer and fourth among the men’s NCAA participants with 13 points scored this weekend. Arkansas’ final scoring came from an eighth-place finish in the 4x400-meter relay team of McLeod, Lawson, Kenzo Cotton and Marqueze Washington.